One of the defining characteristics of Pauper is its lack of a true sweeper. The absence of a Wrath of God effect has a pronounced impact on every facet of the format. The cost for overextending on the board is minimal and control decks have to attempt to get ahead early and stay up on cards. There are some conditional board wipes in Crypt Rats and Evincar's Justice, and Black decks make good use of this pair. Electrickery sees heavy play as a way to handle an army of tokens and other low toughness creatures. But these do nothing against larger threats. For years, Pauper was just fine with these cards being present. There was a balance but it was apparently rather precarious. Lately, however, Pauper has needed to learn on a different conditional way to remove a large number of creatures. Astute readers may notice that there is an important card missing from the above list of board wipes and that card is going to be our focus. Swirling Sandstorm is a card that does nothing without Threshold. With at least seven cards in your graveyard it becomes an Earthquake that hits only creatures. It requires a ton of setup and is also vulnerable to graveyard hate. All that being true, it still can take out the vast majority of threats that see play in Pauper. So why should this card see play over a more consistent card like Evincar's Justice? 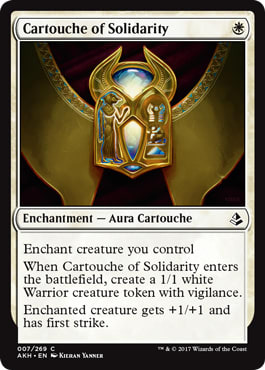 Amonkhet has given Hexproof Cartouche of Solidarity and that has pushed the deck to another level. Hexproof was already adept at crafting a monster large enough to survive an Evincar's Justice but that same threat would easily fall to a Chainer's Edict. The Warrior token created by the Cartouche increases the difficulty level for removing whatever Hexproof can muster. Stompy has not added any new cards, but with Hunger of the Howlpack it can also sidestep a Justice. Both decks can find themselves immune to Swirling Sandstorm but the Red sorcery can also do serious work against anything besides a creature wearing multiple copies of Ancestral Mask or Ethereal Armor. The additional advantage of being able to remove multiple Gurmag Anglers did not hurt either. After running Mardu for the better part of a week I noticed that the metagame had started to shift. The addition of Cartouche of Solidarity meant that my removal no longer lined up as well against Hexproof and it also seemed that Stompy had increased the number of copies of Hunger of the Howlpack it ran. I figured I would test the hypothesis that Swirling Sandstorm was a reasonable card. To do that I went to a deck I had not picked up in a few months. I decided against slotting the deck into Mardu because I wanted to see how Swirling Sandstorm could work on its own. Making it work in Mardu might have been the result of the surrounding removal suite. Instead I wanted to give the card a chance to be the centerpiece of a plan while also providing a home that could consistently hit Threshold early. Because of this, I went with a Reanimator build. I had advocated a similar deck back in Peregrine Drake’s heyday as it could present an Ulamog's Crusher on turn two or three and proceed to devour multiple permanents. The deck runs on a discard and Stinkweed Imp engine. It wants to have a copy of Ulamog's Crusher in the graveyard alongside Dragon Breath and then get both back with Exhume. Reanimator is a combo deck that has some ability to fight into the midgame but can often find itself lacking once both players hit a state of mana abundance. To stitch the combo together the deck runs Insolent Neonate, Faithless Looting, and Tormenting Voice. These cards all help to bin the correct pieces while also digging toward an Exhume. Having Stinkweed Imp in the graveyard and Exhume in hand is ideal as you can start churning cards to find the right two. Shred Memory serves double duty in finding Exhume while also breaking its symmetry. The correct plays with Rakdos Reanimator involve giving yourself the best chance at resolving an Exhume for an Ulamog's Crusher. To that end the early stages of the game are spent churning through your deck with Tormenting Voice and Faithless Looting to find the right cards. Sandstone Needle is of vital import as it can generate a burst of mana to set up a second turn Looting into Exhume. Sandstone Needle also pairs well with Manamorphose, allowing the nominally Red land to help cast Exhume (and in a pinch, casting Green cards in sideboard games). The Needle also enables you to cast larger threats late and it is not out of the realm of possibility to resolve an Ulamog's Crusher for full price. Ideally you want to have won the game by that point but sometimes things don’t break the way you want. 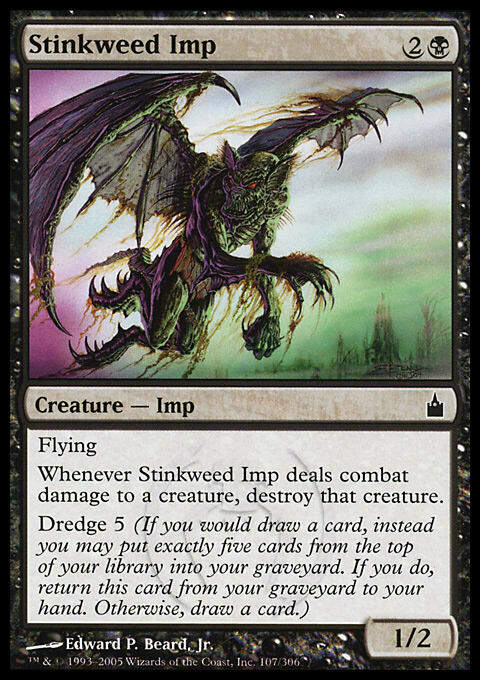 Managing Stinkweed Imp is a key to making Reanimator work. You want to avoid Dredging it unless you have access to Exhume already. Once you do, you absolutely want to Dredge at every opportunity to assemble the correct mix of cards in the graveyard. Modern fans already know how strong Insolent Neonate can be in these decks. The Vampire works wonders here as you can pitch a Stinkweed Imp in hand and then immediately Dredge it to fully stock the graveyard. Despite the recent showings from Cathartic Reunion in Modern, I prefer Tormenting Voice as you cannot afford to pitch two cards with Reanimator. Unlike Dredge, there is not the correct density of cards with graveyard synergy to make the additional cost worth the extra draw. The sideboard is where Swirling Sandstorm found a home. The deck does not always want access to the effect — there are plenty of matchups where it does not matter — and so being able to bring it in against Stompy and Hexproof seemed key. Seeing a rise in Affinity I wanted access to Fangren Marauder. Marauder provides a healthy body and the life gain effect makes it a challenge to win with Atog and Fling. I originally had three copies but shaved one and added two Ingot Chewer as a way to fight Artifacts, but specifically Relic of Progenitus. Pyroblast is a way to win fights over Exhume while Electrickery is there largely as an additional hedge against Hexproof and for decks that want to go wide with Battle Screech. The last two cards in the sideboard deserve additional explanation. Pauper league grinder Kungfutrees put in work last season with his take on Izzet Delver. The past few weeks has seen him stumping a Exhume deck featuring Greater Sandwurm. The Amonkhet common has the advantage of being able to get itself into the graveyard which is important when battling Relic of Progenitus or Nihil Spellbomb. Cycling after the exile trigger resolves while Exhume is still on the stack will ensure that some large monster hits play. While Sandwurm will not eat permanents it cannot easily be chump blocked. Against decks like Elves this can be a game breaker. The second card is Cartouche of Ambition. Kungfutrees ran Vampiric Link as a way to put himself out of range of Burn decks and others that wanted to aggressively pressure his life total. I opted for the Cartouche because not only does it take out a small creature but it also grants Lifelink. This is important as Vampiric Link’s life gain is a triggered ability and utilizes the stack. Because of this it is possible for a Burn player to respond to the damage with flurry of spells to end the game. So back to Rakdos. The deck performed admirably early in the week. I was impressed with how well the deck did against Stompy and Hexproof, but also Affinity and Burn. In the Green matchups the ability to present a large threat early often proved too much to handle. Post board Swirling Sandstorm would often seal the deal as it could blunt any assault. Burn, despite being incredibly consistent, is not able to keep enough permanents on the board to effectively defend against Ulamog's Crusher. Affinity could win quick but an Exhume resolved on Fangren Marauder can seal the deal early. As the week progressed, however, I started to see more decks that were strong against Reanimator. Red Deck Wins proved to be incredibly problematic due to the number of creatures with Haste in the deck. Any Black based removal deck is a nightmare as Chainer's Edict and Doom Blade work wonders against a Crusher and those decks seem to be back in force (not too mention their access to Bojuka Bog). The various Ichor Wellspring — Kor Skyfisher decks also are a tough matchup as they can simply accrue enough cards that attacking with Crusher for the first time after turn four is often not enough. Against slower decks an early Relic of Progenitus is fatal. Because of these factors Rakdos Reanimator remains largely a metagame deck. 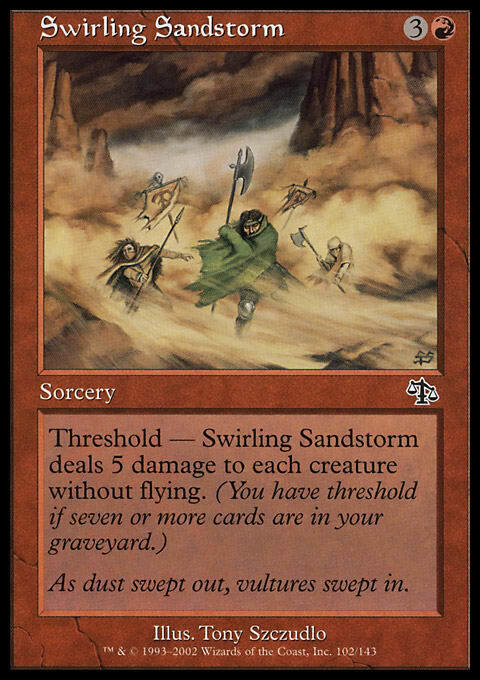 Moving forward, I would absolutely look for more homes for Swirling Sandstorm. The card proved its worth and has the capability to absolutely change the shape of a game. Maybe the deck features Cathartic Reunion alongside the White Embalm creatures and Battle Screech as a way to produce threats from beyond the grave. Moving forward with Rakdos Reanimator I would want to find a way to include a Temur Battle Rage somewhere in the 75 as a way to win from behind. I am also intrigued by Horror of the Broken Lands as a way to get around Relic of Progenitus. Horror increases the strength of Faithless Looting and Tormenting Voice as it allows the deck a way to attack that circumvents graveyard exile effects. The fact that it has cycling also gives Reanimator another way to have a threat on the second turn. Sometimes the best way to test a new card is to see how it works in a deck you know well. Rakdos Reanimator is not a world beater, but I knew how to pilot the deck and had a reasonable understanding of its place in the metagame. As it turns out Swirling Sandstorm worked beautifully even if the deck faltered. Maybe Hour of Devastation will give us another way to summon titans directly from the graveyard. But I won’t be holding my breath.